At £509, this guitar already smells like a bargain, but shop around and you'll get an even better deal on this little slab of tonal nirvana. Effortless playability. Short scale length is great for beginners. Versatile tones. Some players may prefer a longer scale. The original mouse that roared, the Duo-Sonic is a short-scale student model that has become highly prized for its excellent playability and tone. Designed for kids with small hands and a tight budget, it was launched in 1956 before receiving a slight makeover in '59. 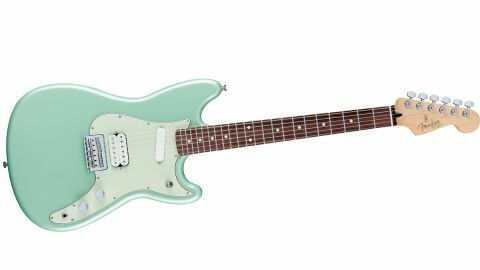 The Mexican-made Offset Series HS version is based on the '64 Duo-Sonic II, which was basically a hardtail version of the then-new vibrato-toting Mustang model. The Duo-Sonic's slab alder body, flawless in sparkly Surf Green, features the classic offset Fender waist that gives the series its name. While original Duo-Sonics came with three-saddle bridges, the HS has a six-saddle hardtail with through-body stringing for better intonation and action adjustment. The three-ply white/black/white scratchplate also plays host to a chrome-tipped three-position pickup selector switch and knurled (aka easy-grip) volume and tone knobs servicing two pickups, a neck single coil plus a bridge humbucker - something original SS-format Duo-Sonics could only dream of. The latter is also coil-splittable via the push/pull tone knob. We've encountered guitars at more than twice the price that don't play anywhere near as well as this thing does. The 610mm (24-inch) bolt-on maple neck is complimented by a string-bending-friendly 241mm (9.5-inch) radius rosewood fingerboard, 22 medium jumbo frets and a set of modern-looking tuners. While the small headstock has a glossy look, the back of the neck is coated in a satin finish to prevent even the sweatiest of hands from getting stuck. Before we plug in, we have to say, we've encountered guitars at more than twice the price that don't play anywhere near as well as this thing does. Oh, and it doesn't matter what size your hands are. Straight from the box, it impresses with a low, buzz and choke-free action via its slim C neck profile, fat frets and factory-fitted 0.010 to 0.046 gauge strings. The tuning stability is faultless, too. While Jimi Hendrix played a Duo-Sonic early in his career, it was Nirvana's Kurt Cobain that sparked the huge interest in Fender student models when he thrashed his way through a bunch of vintage Mustangs in the early 90s. Kurt liked to modify his guitars, hence his humbucker-boosted short-scale 'signature' Jag-Stang, Mustang and Jaguar models. He also tweaked his 'Stang vibratos to make 'em hardtails. So, the Duo-Sonic HS is pretty close to what Kurt was into. There is another important factor at play here. Dropping the scale length from the 648mm (25.5 inches) found on Fender's Strat and Tele models doesn't just make the Duo-Sonic's strings a bit easier to bend. Tonally, its scale retains some of the brightness and bottom-end twang of a Strat and Tele, especially if you use 0.010 or higher gauge strings, yet you also get a chunkier rhythm sound. So, while this guitar's pickups sound fat, there's maximum note separation, no matter how thick the filth is. That clarity is further boosted when you coil-split the bridge 'bucker. If we had to use a song to describe the tonal range of the bridge pickup, we'll have Smells Like Teen Spirit, please. A clean setting here echoes the clattering rhythm voice of the song's intro while a fuzz box unleashes a racket not unlike the heavy sound Kurt craved. If it sounds like we're typecasting this guitar then rest assured the Duo-Sonic is versatile enough to handle country picking, surf, indie, classic rock, whatever. Plus, the neck pickup warms things up perfectly for clean or dirty blues lead (blues-rockers Rory Gallagher and Johnny Winter owned Duo-Sonics, after all) or jazz chords. An original 60s Duo-Sonic II will cost you about a grand; and you can double that estimate for a Desert Sand-finished 50s model in good condition. With our little HS, Fender has taken the stuff that makes those vintage classics so desirable - the shorter scale, lightweight body and slim neck - and hot-rodded it with modern elements - big frets, 241mm (9.5-inch) fingerboard radius and coil-splittable humbucker - that enhance the performance and tone.